Most claims management systems are only focused on managing claims workflow. While this is also true of Open Claims Gateway (OCG), OCG goes one step further by making your customers a natural extension of the claims system. This ensures that, even in a bad situation, your client’s experience is the best it can be. With OCG there is no hassle. Using our customizable list of repair shops and Independent Adjusters (IA), your representative can select a shop or IA in a matter of seconds. The shop or IA can directly send estimates, photographs and any other necessary documentation to your adjustor, who can then perform a compliance audit and/or approve or reject the claim on the spot. This speeds the repair process, shortens throughput and increases your customer’s satisfaction with the entire process. The repairer has the option to create a consumer estimate, which translates the shop estimate into easy-to-understand text and graphics for the vehicle owner. We are proud to serve the Collision industry. We’re investing our many years’ experience toward creating the most efficient, reliable, and easy-to-use software to assist in settling claims. Contact Us for more information about how the Open Claims Gateway can help you! Want to identify possible items missing from the estimate? We can help. The free SCRS Complete Repair Planning Guide Scrubbing is provided as a service to the industry by VehicleOwnersGuide.com and the Society of Collision Repair Specialists. And it’s not just free – it’s easy. Print a Mitchell®, CCC®, or Audatex® estimate to a PDF text file and save it to a folder on your system. From the Browse for an Estimate to Scrub Now section, click Choose File and select the saved estimate from the Open window. Click Open then Click Scrub. Using the official SCRS Complete Repair Planning Guide as a template, you will receive a free detailed scrubbing report that identifies items that may be missing from the estimate. Through EstimateScrubber, a repair facility can create an estimate that translates typical shop-speak to one that uses clarifying graphics and simple, readily understandable text for consumers to read. This clear estimate is a helpful aid to make necessary repairs apparent to customers. It also becomes a potent marketing tool for shops to stand out from the competition. Using EstimateScrubber and Consumer Estimates communicates the status of the repair directly to the consumer. They can see the estimate, status, any repair notes and a translation. This is the best and quickest way to communicate and serve your clients while reducing unnecessary phone calls. Contact Us for more information about how the Estimate Scrubber can help you! Imagine: You have an accident and your vehicle is damaged. 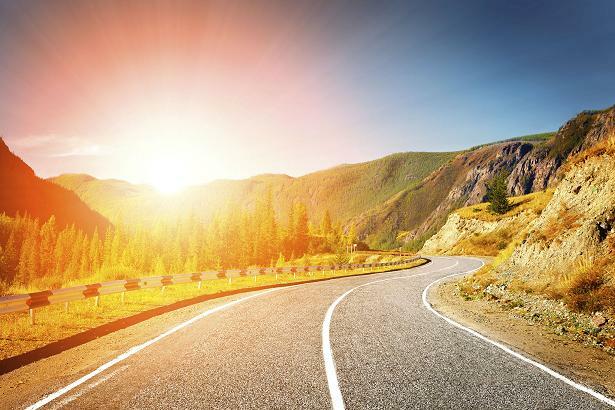 All you want is your vehicle properly repaired with the least amount of disruption to your life. You have to select a shop but you probably know nothing about them, not even where they are located. This can be a hassle and you may rely on your insurance company to help. You listen to their recommendations, receive an estimate, drop your vehicle off, sign a few papers and leave a check for your deductible. Now you wait for the call to pick up the vehicle. We Make It All Easy for You. For Free. VehicleOwnersGuide.com can help through these free options. 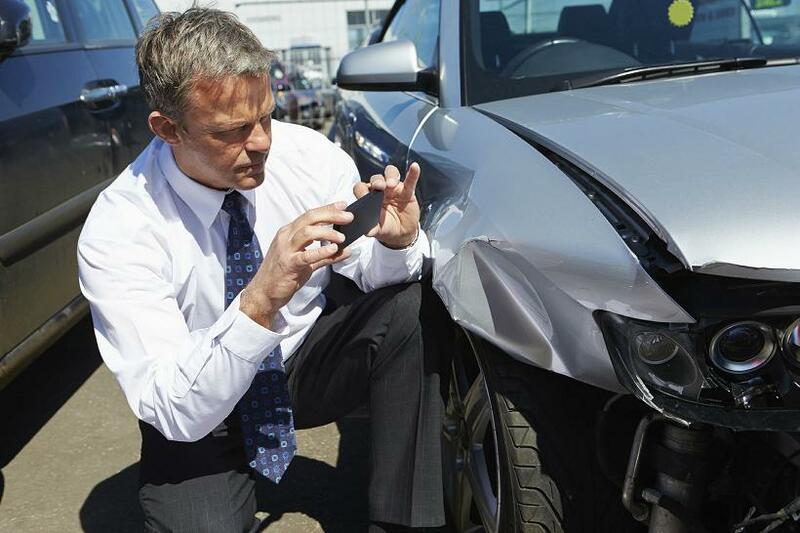 We offer you a shop locator with listings that include over 1,000 collision repairers. Just add your Zip Code to the shop locator link and select Display. We offer you a consumer estimate translation. This acts like a guide to help explain the repairs using graphics and easily understood language. You can access the original estimate and translation in one simple process. We also offer the ability for the repairer to use an easy, fast way to communicate with you the status of the repair and other notes or annotations that may be needed. Ask the repairing shop for your E-Code and free Consumer Estimate when you receive an estimate. Contact Us for more information about the consumer estimate! VehicleOwnersGuide.com was founded in 2009 in San Diego, California by industry professionals. It is a portal where owners can receive a free guide to the repairs done to their vehicles. The portal provides consumer friendly information leading to more satisfied owners. Vehicle information is obtained by providing Software as a Service (SAAS) repair scrubbing and claims management to repairers and insurers. EstimateScrubber.com is a SAAS where repairers can at no cost scrub and upload repair estimates which in turn can used to create personalized Consumer Estimates for vehicle owners. Over 20,000 unique repairers have visited the scrubber. The site uses the Society of Collision Repair Specialists (SCRS) Complete Repair Planning Guide and provides the scrubbing results in English and Spanish. 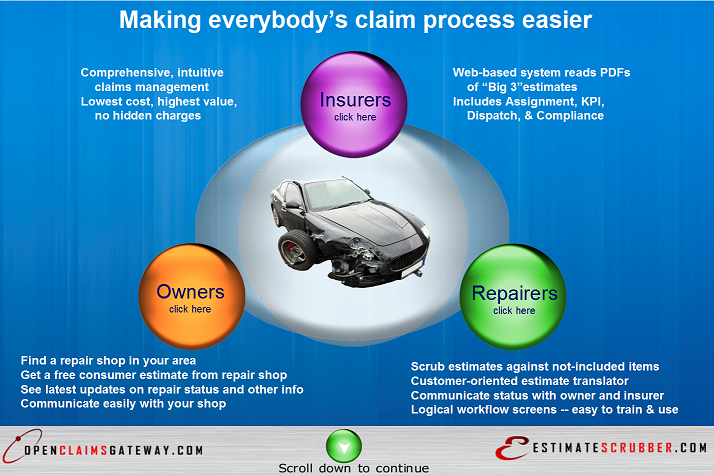 OpenClaimsGateway.com is a full feature claims management SAAS insurers can use to manage the claims process. The system contains unique features such as adjuster assignment transfers, estimate translations, full compliance review of printed estimates, plus standard features such as assignment, work-flow management, KPI and estimate review. It also has the ability to seamlessly work with any in or out of network repairer in seconds. We are currently seeking strategic partners, shops to register in our database and Open Claims Gateway beta customers for our most recent software releases. Simply fill out the adjacent fields and send us a brief message. We’ll get back to you as soon as possible with more information.